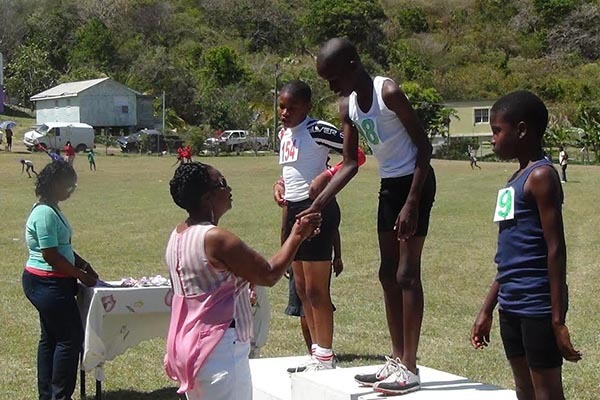 The action was at the Gingerland Recreation ground (GRG) on Thursday 6th March as the Joycelyn Liburd Primary School held its annual sports meet under the distinguished patronage of former headmistress of the school, Mrs. Marion Lescott. In keeping with the legacy left by Mrs. Lescott, current Headmistress Ms Barbara Hendrickson and her staff, ensured that the meet commenced promptly at 12.30 pm, with the athletes already being sent to the parade area since 12.15 pm. The completion was fierce and the crowd swelled especially at the end of the work day and some of the parents even got involved in the flag waving and cheering on the children. The races for the day included 60 meters; 100 meters; 200 meters; 400 meters; 800 meters; 1200 meters; the 4 X100 meters and the 4X400 meters. Also making a huge hit for the second year running, was the hurdles event, with the athletes showing vast improvement over the last year. A few records were broken in the process and at the end of the day, after a very close contest, Green house came out victors with Blue house forced to settle for second place.